@Chohole. Thank you. In the moment it is 6 o'clock p.m. here in Switzerland. I'd need 4 hours more. Would that be acceptable? @ Mermaid: Very nice idea and the smoothen has Horo already noted. My belated thanks for the comments on my first entry. Always appreciated. My Second Entry: “Infinity Road”. Seamless road image from CG Textures. G2 Female outfit and hair by Out Of Touch. G2 Male outfit by Lura and hair by 3DCelebrity. Buildings, vehicle, ruble and grass by Stonemason. Sign modeled in Modo and image texture created in Photoshop. The road image is applied to an infinite plane with a bunch of terrains to obscure the left to right repeats. Illuminated by the sun and Sky IBL. Rendered at 64 RPP, True Ambience enabled - a little over an hour to render. Dan - what a great entry. I hope these guys have their car just behind them out of the picture. Takes quite a while to walk this road since it continues to infinity. Here is my entry. It was just the idea to have been inspired by a famous picture, which I found interesting and fun. There is absolutely no intention to criticize any Bryce users. @ Dan Whiteside: it's a long way to infinity... Well done. @ Electro-Elvis: interesting collage, like it. Dan Whiteside : cool idea, excellent scene. Electro-Elvis : very original, I like it. waow..... so many wonderful Pictures and great Ideas. very well done. Does anyone need any more time? or can we now close this challenge? I may need more time because I want to replace my entry going on Horo's suggestion, unless I can replace the entry even if the thread in closed, then that will be cool I'm rendering it now. @ Dan Whiteside: Highway endless? Very cool idea and well done. Nice pic. @ Electro-Elvis: Nice collage and well done. And now good luck to all participants. Really great work here. Electro-Elvis - I know the original that inspired you. The idea of having the end of the world sphere done this way is superb. Thanks all for the friendly comments. @Horo: Hm, I never saw Flammarions picture as a comment for the end of the world, but man looks beyond his horizon. Interesting. or should it be New Discussion ?? Dan: great render. I love the wreckage you create. I’ll look at this while ‘Road to nowhere’ of the Talking Heads is playing! Electro-Elvis: Very original and very well made. Good luck with the voters, everyone! 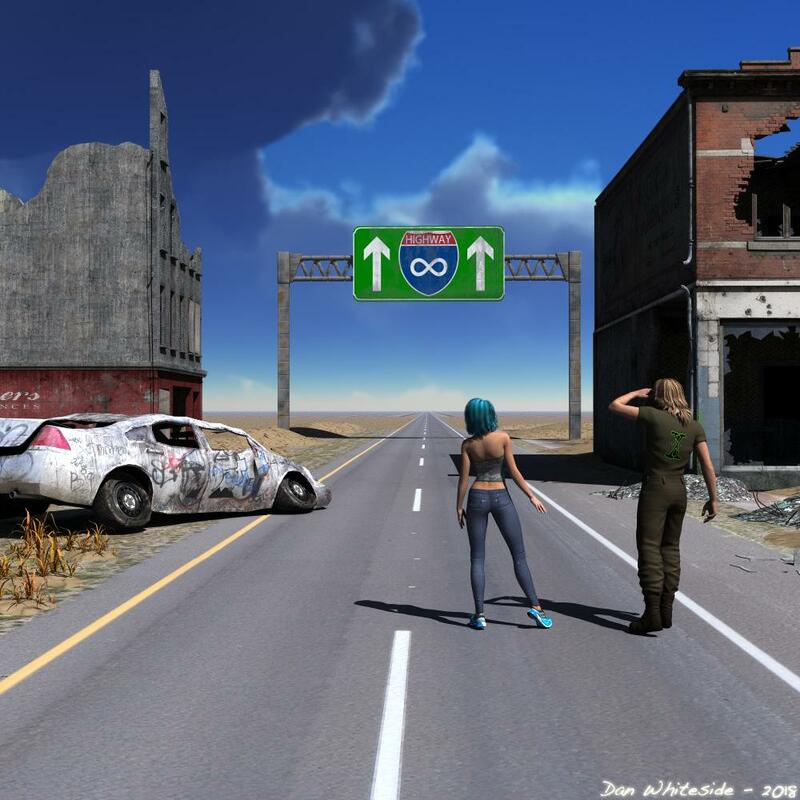 @danwhiteside... Infinity Road is really great... it looks like it goes on for infinity... just like the sign says..
ed3D - "Infinity Highway" is indeed a more acurate title but the image (and title) was inspored by a Isaac Asimov book cover, "The Road to Infinity". Hansmar - Thanks and a good music choice - big fan of the Talking Heads. Same as it ever was LOL. Good luck to all - looking forward to the vote. @Apoc: Thanks for asking. "A Step Further" (Maybe a Daz manager sees my little pic and thinks "Oh, great idea. Let's make a next version!" ) Ha, ha, ha just joking I'm afraid. we also got another outstanding 39 voters this time around.